With the 2016 Summer Olympic Games beginning this weekend, top athletes will be center stage, trying to perform at the top of their game to take home the gold. Athletes and trainers are always on the lookout to give their performance a slight edge over the competition. Because this year’s games have already been marred by reports of widespread doping, the focus on natural products that could assist athletic programs is even greater. Now, a new study led by researchers at Northumbria University in the U.K. describes how Montmorency tart cherry juice could be a promising new recovery aid for soccer players following a game or intense practice. The small, double-blind, placebo-controlled study found that Montmorency tart cherry juice concentrate supported recovery among semiprofessional male soccer players following a test that simulated the physical and metabolic demands of a soccer game. The new study involved 16 semiprofessional male soccer players aged 21 to 29 who were randomly assigned to either a Montmorency tart cherry concentrate (MC) group or a placebo control group. Montmorency group participants consumed about 1 ounce (30 mL) of a commercially available Montmorency tart cherry juice concentrate mixed with 100 mL of water twice per day (8 a.m. and 6 p.m.) for 7 consecutive days— for 4 days prior to the simulated trial and for 3 days after the trial. Following the same schedule, placebo group participants consumed a calorie-matched fruit cordial with less than 5% fruit mixed with water and maltodextrin. 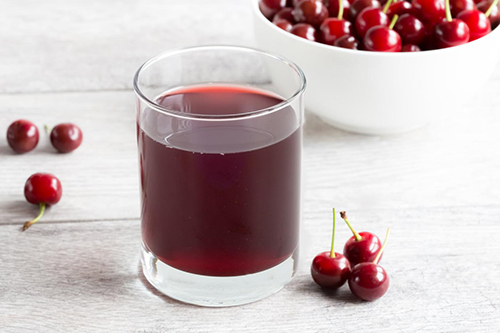 The 30-mL dosage of Montmorency tart cherry juice concentrate contained a total anthocyanin content of 73.5 mg or the equivalent of about 90 whole Montmorency tart cherries. When compared to placebo, MC was found to maintain greater functional performance, impact a key marker of inflammation, and decrease self-reported muscle soreness among study participants following prolonged activity that mirrors the demands of field-based sports. Additionally, across every performance measure, including maximal voluntary isometric contraction, countermovement jump height, 20-meter sprint time, knee extensors, and 5-0-5 agility, the MC group showed better performance than the placebo group. Moreover, the MC group showed significantly lower levels of interleukin-6, a marker for inflammation, particularly immediately after the trial. Ratings for muscle soreness [delayed-onset muscle soreness (DOMS)] were considerably lower in the Montmorency group across the 72-hour posttrial period. “These findings suggest MC is efficacious in accelerating recovery following prolonged, repeat sprint activity, such as soccer and rugby, and lends further evidence that polyphenol-rich foods like MC are effective in accelerating recovery following various types of strenuous exercise,” the authors concluded.